HOW on earth can we think about the task of making homemade pickles when we just got over Thanksgiving!!! ….even if you are not hosting, just about any family event can be exhausting. That is why I envy the stamina of the Black Friday shoppers the day after Thanksgiving. I hope your Thanksgiving was great and I have to confess that our Thanksgiving dinner was successful for Me and My Captain. Yummy food and I love the left overs. This recipe always receives a lot of requests. I absolutely love them… if you have never tried them, you must. If your garden cucumbers are not ready yet…which I suspect they are not, one can go to a farmers market or super market and pick up lovely cucumbers. Cinnamon Pickles don’t have to be for Christmas only…but they certainly add to your Christmas tablescape! First off, I love to can and preserve foods. It is just comfort for me. These Cinnamon Pickles are so easy to make and you can use any size cucumber. Most people prefer the small pickling cucumbers because they don’t get tough but any size will work. These are so pretty to set out on your Christmas Dinner table and they taste so yummy! This recipe has been in my recipe file for years and years and I remember my grandmother making these for Christmas as they are so bright red from the cinnamon and red hots. They almost look like glass and are almost too pretty to eat. I have made these from time to time, but I have to tell you they do have a process that takes some time…actually 4 days. Before you turn away and say, too much work for my busy days…let me say that there is only one small task each day, and then you return to your regularly scheduled program, ignoring the pickles. Let me show you the easy steps. First, you will need cucumbers which you will peel and seed. This is relatively easy, just use a spoon to scrape out the seeds of the cucumber much like you would a cantaloupe. Then you cut into strips and then cubes. You will need pickling lime and alum which can be found in your supermarket. After cutting into cubes (or you can leave the long strips)….you add about 8 quarts of cold water into a glass bowl along with the lime…then add the cucumbers. The next day (day 2) drain the lime water off and discard. Wash the cucumbers and cover again with cold water and ice and soak for about 4 hours. Then you make your brine mixture…add your cucumbers and simmer. Drain them and make the syrup and add to the cucumbers and simmer some more. Then you let the cucumbers stand overnight. Day 3…drain the syrup from the cucumbers and reheat the syrup, and pour back over the cucumbers. Day 4 Repeat the same process. On Day 5….prepare the jars, drain off the syrup and save….pack the cucumbers into the jars…add the syrup and process. I have to admit…we have been enjoying these pickles for a couple months now. My dear readers, Have you made pickles? 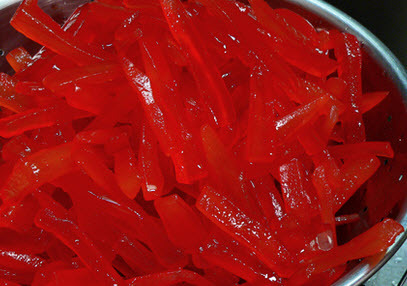 A wonderful treat of red, cinnamon-ey cubes of sweetness in a pickle. This recipe is so old…I can not even imagine the original date…It has been handed down generation to generation. It is not difficult to make…just a few extra steps over a period of 4 days, but believe me when I tell you they are simply delicious. Combine cucumber cubes, lime, and water and let set at room temperature over night (at least 24 hours) stirring occasionally. Drain and rinse and soak 3 additional hours in clear water and drain. Mix 1 cup of the vinegar, red food coloring, and alum. 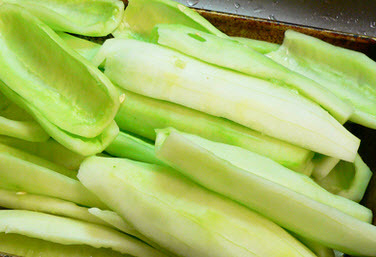 Place the cucumber cubes in large stockpot and cover with water. I place my cucumber cubes in an old crock that I have had for many years…but you can use any large container you may have. After bringing the red hot mixture to a boil, I pour the mixture over the cucumber cubes in my crock. Cover with cheesecloth and let set in a cool place for 24 hours. The next day, pour off the liquid from the cucumber cubes and into a saucepan. Reheat to boiling. On the 4th day, place the cucumber cubes and the syrup liquid into a large stockpot and boil the entire combined mixture for about 5 minutes. 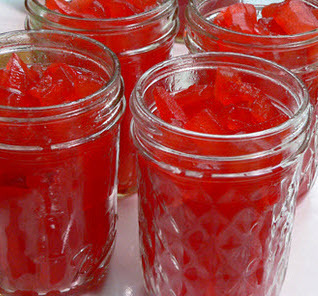 Ladle the cucumbers into sterilized jars (and lids), adding enough syrup to each jar to keep cucumber cubes in liquid. Place sealed jars in a “canner” (or stockpot of boiling water) and process for 20 minutes. I use quart jars as these cinnamon pickles do not last long once opened. They are that good and well worth the extra effort it takes to make. This recipe makes about 7 quarts of the cinnamon pickles…but you may use pint jars if you prefer.